Security Fencing also known as Heavy Duty Fencing is extensively used around schools, commercial and industrial properties. Security fencing is available in a variety of powder coating colours. Crimped Spear panels and gates have a sharp point at the top. This is an advantage as it creates security around your premises. 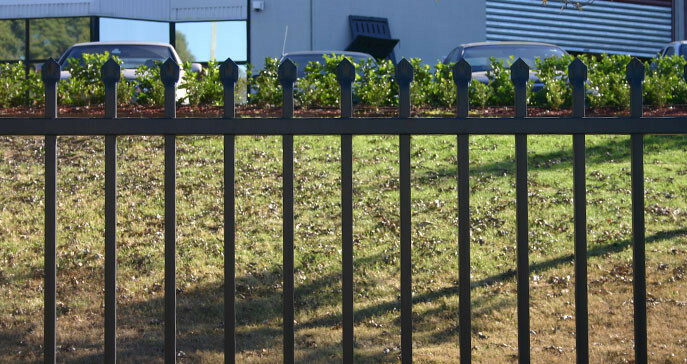 This type of security fence is the most popular type, and is widely used in commercial and industrial estates. GramLine® LockOut™ is a NEW type of security fencing that is currently under development. It’s to be released in 2015. LockOut™ is made from high tensile steel and has an attractive two-tone or two colour finish. The LockOut™ system will come packed in cartons as a knock-down-kit so it can be easily assembled on site or you can assemble it in your factory. The combination of high tensile steel and the efficient rolled profile will make LockOut™ strong and secure without the need for traditional heavy gauge steel, which has a lower material strength and a higher cost. LockOut™ will be the new smart choice for cost effective, fast security fencing. LockOut™ security fencing will have a two toned or a two-colour picket. We have yet to decide which colour combinations will be offered so we invite you to submit your suggestions using the ColorSealed® prepainted Steel colour chart as the basis for selecting colour combinations. We provide custom punching of steel and aluminium rails and square tube with metal thickness of up to 2.0 mm. The punched holes available include round, square, and rectangular shapes as shown in the table below.